So Lonely in Gorgeous: One Day Only! 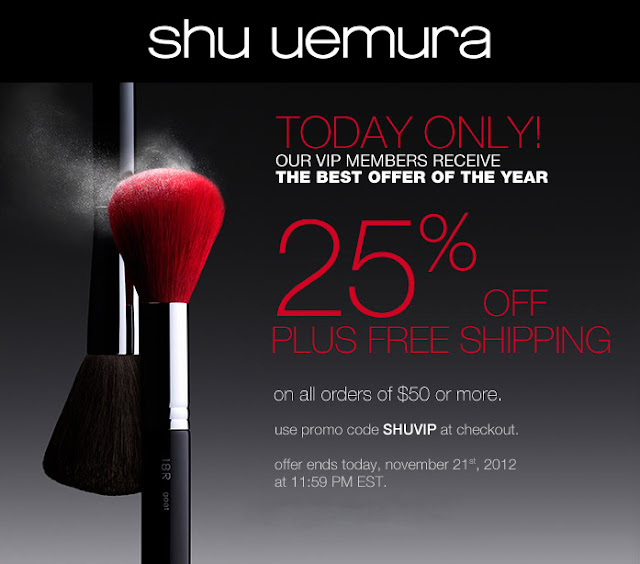 25% Off Shu Uemura! oooh, thanks! you ordered something form the newest collection KL for shu uemura, right? You're welcome! Hehehe...I got the entire collection...minus one lipstick and the nail polish. Thanks for sharing! I have been so deprived from Shu. Hi Rola, I really need to post my shu products! Every time I want something from them I have to do some wheeling & dealing & get all my friends 6 contacts involved to get it to me. I feel your pain Buggsie, but in a different way. Cosmetic brands over here never, NEVER, offer a discount promotions. I purchased the KL collection from the states. I'm waiting for my sister to mail all the holiday collections after Christmas. The '6' is an '& '.